Home » News and Views » Bloomsbury Publishing #BMY shares still attractive in run up to interim results, says VectorVest. By Harry Dacres-Dixon in News and Views, VectorVest on 17th October 2018 . London based Bloomsbury Publishing Plc (BMY.L) is a leading independent publishing house established in 1986. It has companies in London, New York, Sydney and Delhi. It publishes media and electronic reference material, children books, fiction and non-fiction books, audiobooks, scholarly imprints, library of reference materials, educational books, dictionary and language books, literary, adult non-fiction books, academic books and journals, and sports yearbooks. 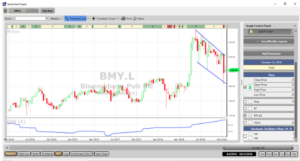 On July 18th 2018, BMY published trading results for the four months ended June 30th 2018. Total revenues rose 3.7% year on year (up 7.1% at constant currencies). Excluding the revenues of IB Tauris, which was acquired on 30 April 2018, revenues rose by 2.1% (up 5.5% at constant currencies). The Board stated that it believes Group performance for the current year will be in line with its expectations, adding that Q1 traditionally generates the smallest profit of the financial year. Further demonstrating the Group’s exceptional list of authors, The English Patient by Michael Ondaatje won the Golden Man Booker Prize, with Bloomsbury authors making up 40% of the Golden Man Booker Prize shortlist. Results for the six months ending 31 August 2018 will be announced on 23 October 2018. VectorVest initially picked out BMY at 183p back in April this year, when the Harry Potter publisher logged an excellent GRT rating of 22%. Read that article here. Now at 16%, the BMY GRT is still on a very good rating at VectorVest, along with a very good RV (Relative Value) rating of 1.25 (scale of 0.00 to 2.00). It is important to note that BMY rose to hit and pass our then valuation of 219p, and has since sunk back to trade at 202p. Our valuation now stands at 220p, and offers a good RS (Relative Safety) rating of 1.19 (scale of 0.00 to 2.00). Trading at 202p the stock looks like a good investment opportunity ahead of the interim results announcement. 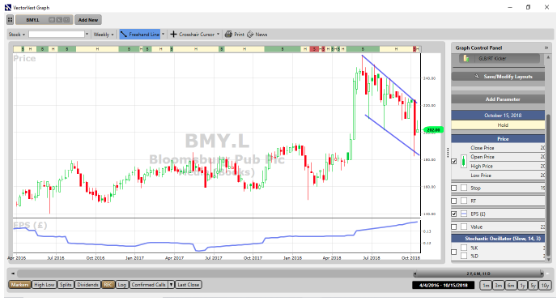 The chart of BMY.L is shown above using weekly candles over the past 2 ½ years. The move called by VectorVest from April 2018 has been followed by a pullback in what technical analysts refer to as a “flag” formation. This is a bullish pattern and a breakout of the flag should lead to a technical objective of around 270p. Summary: In our April note, we stated how, despite the phenomenal success of Harry Potter, BMY is anything but a one trick pony. This highly resilient and investable company has seen immediate contributions to revenue growth from acquisitions this year, while its authors won and got shortlisted for prestigious awards over the summer. With decent revenue growth during an historically quiet quarter and a GRT still registering at 19%, VectorVest still rates the shares as attractive in the run up to the interim results. Readers can examine trading opportunities on BMY and a host of other similar stocks for a single payment of £5.95. This gives access to the VectorVest Risk Free 30-day trial, where members enjoy unlimited access to VectorVest UK & U.S., plus VectorVest University for on-demand strategies and training. Link here to view.